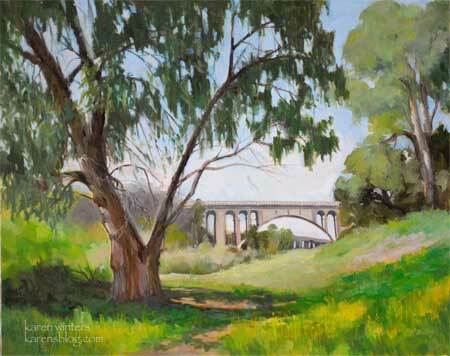 This California landscape is one that is familiar to residents of Pasadena and the communities surrounding the Arroyo Seco. The Colorado Street Bridge , seen here looking northward, rises over the grassy fields that are now turning golden. Only the evergreen eucalyptus, oaks, willows and other natives keep their colors. The 134 freeway bridge can be seen in the distance. On these late spring days it’s not uncommon to see thunderheads building over the San Gabriel Mountains – you can feel the humidity build up at those times. I am counting down the days until my reception at Gale’s Restaurant in Pasadena. Sunday, May 31, 4-6 pm. If you’re local, I hope you can come! 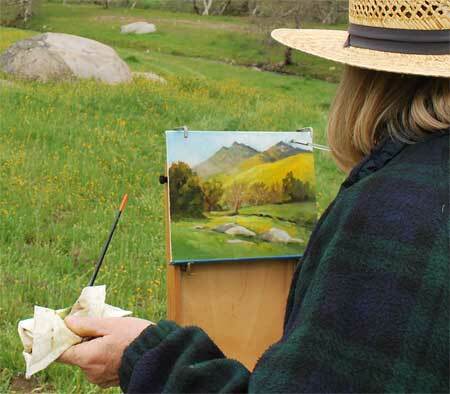 Book tip of the day: Kevin McPherson’s Landscape Painting Inside and Out: Capture the Vitality of Outdoor Painting in Your Studio With Oils . 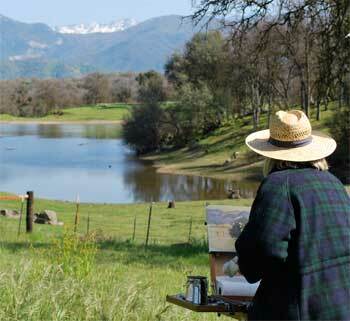 I do plein air painting as often as I can … but I have learned a lot from this book and others about keeping the fresh plein air feeling while painting in studio. Check it out! This California oil painting celebrates the end of the day in Central California as valley oaks are silhouetted by the fading sun. The warm glow of sunset still lingers in the sky. 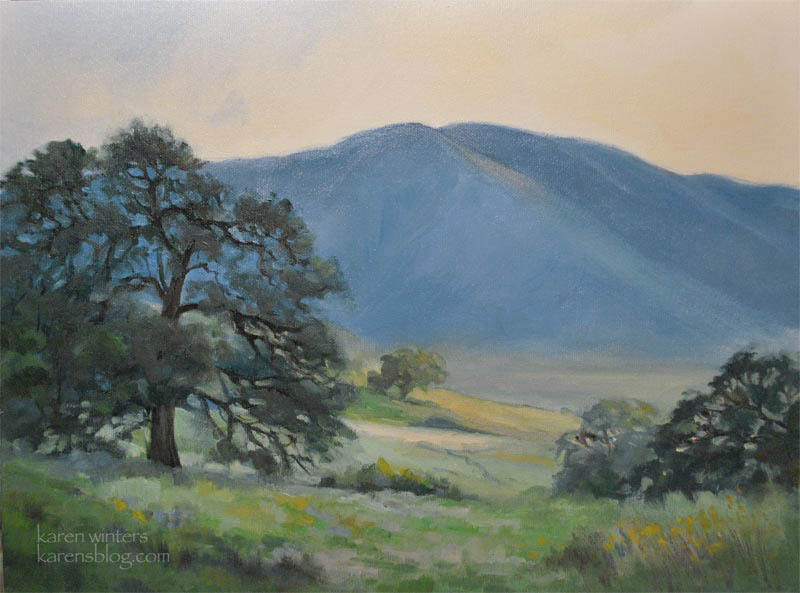 Mist is already starting to form in the distant Sierra foothills, creating a sense of mystery. Last weekend’s opening of the California Art Club “On Location in Malibu” show at the Weisman Museum at Pepperdine University was really outstanding. Although I paint frequently in Malibu it is always interesting to see other artists’ interpretations of the same subjects. I hope to return to the exhibit to see more of the paintings when there is no crowd. It was really elbow to elbow in the galleries. This painting has been sold but I have others. Please write. 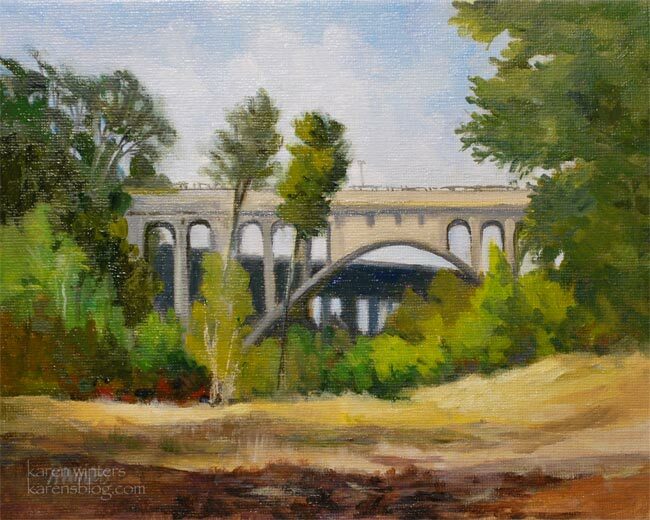 This painting, of Pasadena’s Colorado Street Bridge in the setting of the Arroyo Seco, is one of my favorite renditions of the area so far. Because it is so close to my home, I can visit frequently and observe the changing foliage through the seasons. In the springtime the wide meadow leading down to the river is covered with wild mustard. The mustard is an invasive imported species, not a native, so it tends to crowd out the indigenous plants. But it does lend a beautiful color to these open areas when the light strikes it just so. Every time we go down there we see something different and interesting. One time it was ranger on horseback patrolling to make sure that dogs were on-leash. Another time it was a group of people with a flock of (leashed) goats. Never a dull moment in the arroyo! 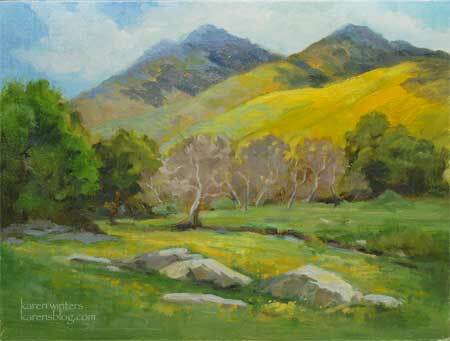 This weekend we’re going to the reception of the On Location in Malibu show, presented by the California Art Club. I’m sure it will be a wonderful event as all of their shows are. Art, Malibu, hanging out with painters … what could be better? 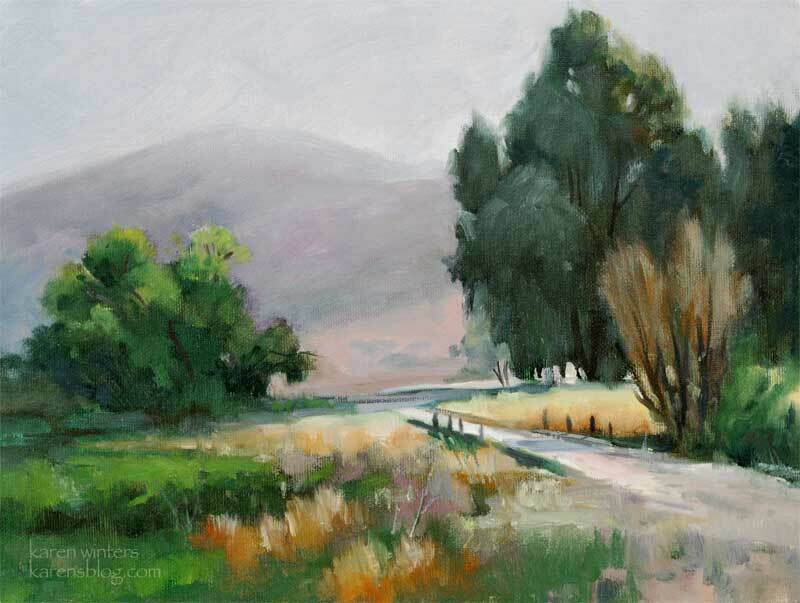 This is another of the plein air paintings I did a month or so ago on our trip up through Central California. A small lake, with trees leaning down to touch the water. Yes, it was cold out there. Snow on the mountains and the wind whipped down and chilled us to the bone. 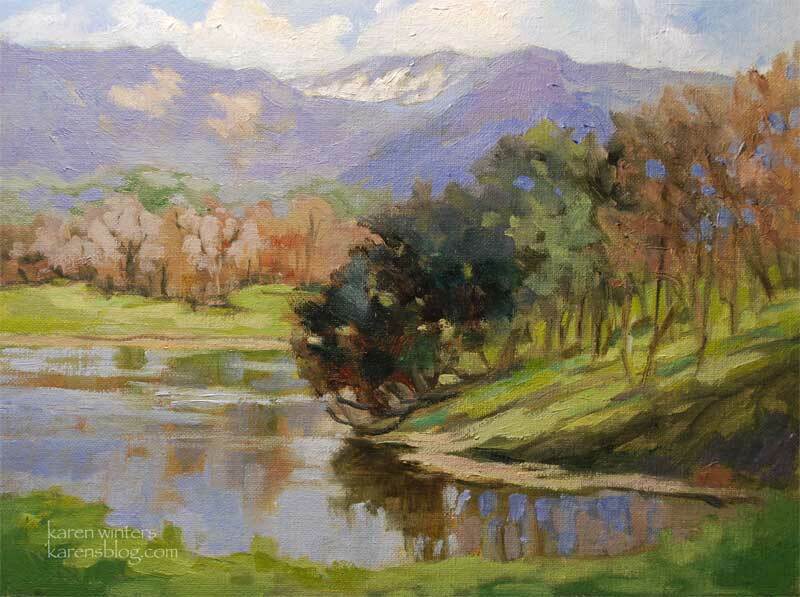 One of the many other challenges of plein air painting is reflections in water. Every time the wind moves, the ripple pattern on the water changes, and that changes what is reflected and what is not. Still water reflects. Ruffled disturbed water does not. But changing wind currents puts the reflections in different places, see? At some point you just have to settle with one thing. Although this is named Blue Heron Lake, I didn’t see any that day. Maybe I’ll paint one in sometime. I have plenty of reference photos of herons in other locations, including at Descanso Gardens. 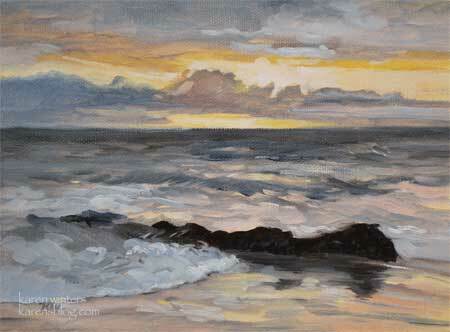 This small painting is a study for a larger Laguna seascape, which will probably feature several different rock patterns rather than just the one. It just felt too cluttered to put multiple rocks in such a small painting. I’m back at the easel, getting ready for other upcoming shows. In a day or two it will be time to start framing again. We’re having some unseasonably hot weather right now. Today it was in the high 80s and tomorrow it’s likely to be 90. 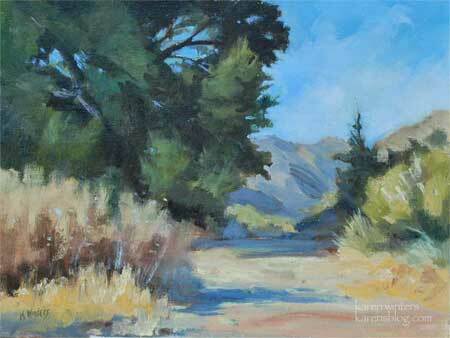 Last year, when I was doing the Sierra Madre Art Fair, it was 100 both days. Because I am showing so many paintings at Gale’s (which hung this morning) I opted not to do the SM Fair just this year. It seemed like I’d be burning the candle at both ends to have 30 paintings for Gale and another 20 for a fair booth. Now, seeing the weather (again) I’m glad I opted to pass. Next year I might do it again, though. Now I’m home in my studio, staying cool, and working on some other projects. A few months ago, after keeping an eye on the wildflower reporting sites, we took a trip up into the foothills of the western Sierras. The online sources were right – they really were really spectacular this year. I started this painting on site, and have been waiting for the opportunity to touch it up in studio before posting here. Among the challenges at this location was a storm system that cast ever-changing shadows over the golden hills. One minute the foreground was in light and the background in darkness. Five minutes later it was the reverse. At the point of laying in my darks I decided to go with the cloud shapes on the distant hills and leave the foreground hill bright, and then to paint it that way no matter what nature was doing. Next week, after my show is hung this Saturday at Gale’s Restaurant in Pasadena, I should be back to painting and posting regularly. There are just too many details to take care of right now. This painting is sold but I have others from the area. Please write me. 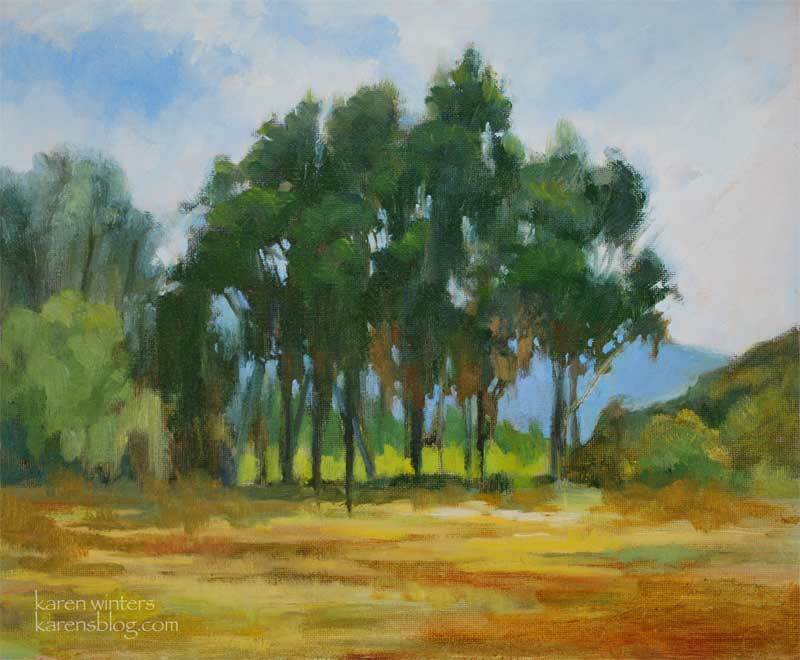 Here’s another little landscape inspired by my Fallbrook trip. There were several mornings when the marine layer had moved in and was cloaking the hillsides with a gauzy look. Around 8 o clock the mist would start to burn off. You can see where the grasses on one part of the field have already started to turn golden. Other foliage still maintains the fresh spring look. I haven’t posted in a few days because it’s been very busy getting ready for my show at Gale’s Restaurant, celebrating Mothers’ Day and taking care of other family responsibilities. Did you know that if you want to see all of my paintings in any one category – such as all Fallbrook paintings, or all mountain paintings that you can filter these posts by categories? Look for the pulldown menu in the left sidebar. If you’ve been following my blog, you know I’ve been preparing for this event for some time. 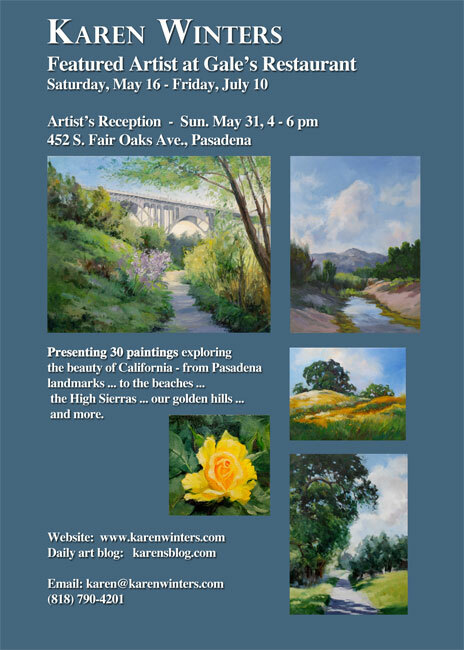 So, if you’re in the LA area and would like to see my work in person, I invite you to come to my show of California impressionist fine art. Reception: Sunday afternoon, May 31, 4-6 pm. This little windbreak was interesting with its varied heights and shapes. It reminded me of a group of kids lined up for their school picture, or perhaps an a capella group getting ready to perform. I had a good time capturing the top light on the trees, which suggests the middle of the day. The short shadows communicate the time of day as well. Studies are useful for many purposes – we learn about how to render certain types of plant life, how to capture the quality of light at a certain time of day, how to describe distant and near objects, even how the sky looks under different weather and lighting conditions.